You are here: Home / Electric Bike News / Win a ProdecoTech Outlaw SS Electric Bike! Win a ProdecoTech Outlaw SS Electric Bike! 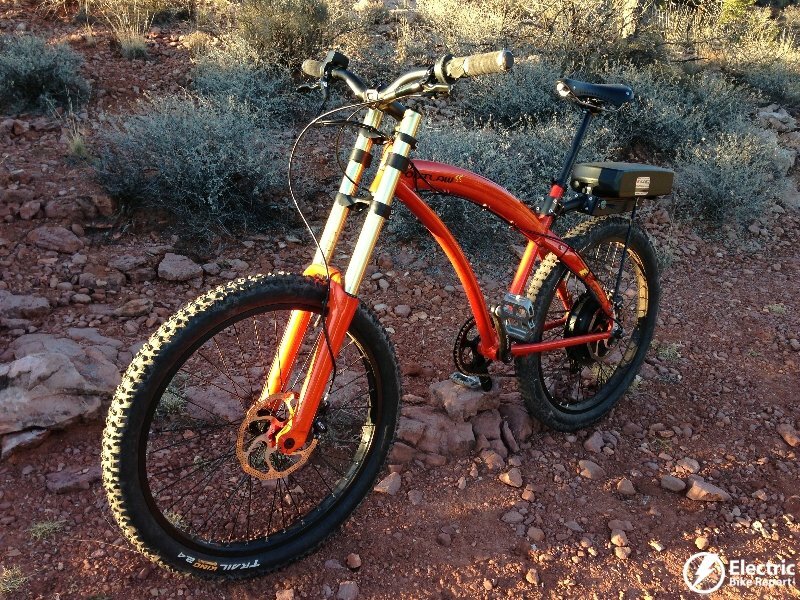 ProdecoTech is giving away one of their fast and powerful electric bikes; the Outlaw SS! To enter to win, simply “like” the ProdecoTech Facebook page. But you better hurry because the giveaway ends this Friday (December 13, 2013). Here is a link to the ProdecoTech Outlaw SS info page and here is a link to my review of the ProdecoTech Outlaw SS. Enter to win an Outlaw SS here. This thing looks so cool I can’t wait to take one for a ride. 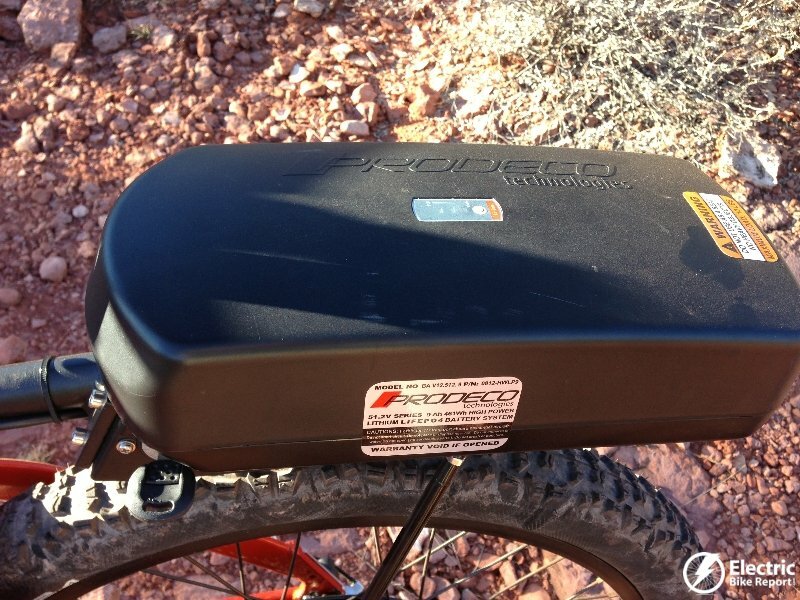 The Prodego Outlaw SS is a good bike–I own one–I own others too. It is solid and well made. 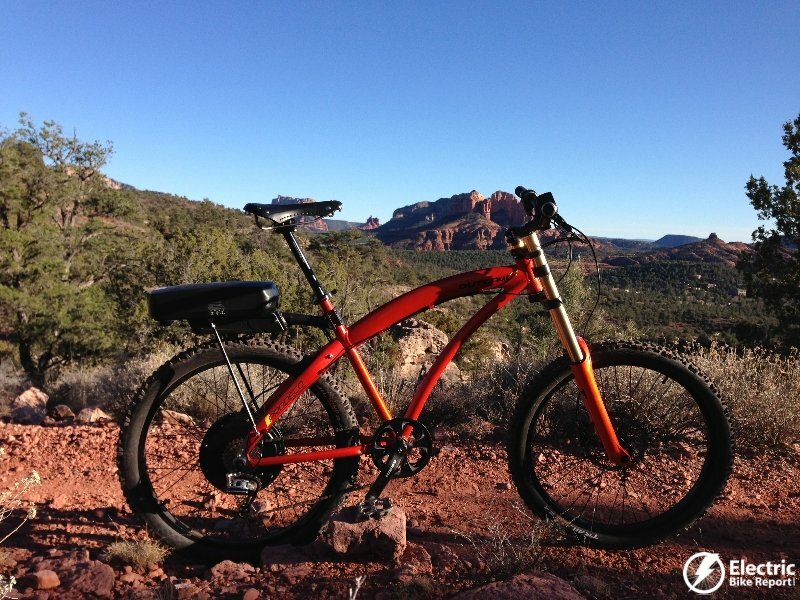 For the price 0f $2400 it is an excellent entry level ebike. However it is NOT “high end.” Let’s keep or feet on the ground here–it’s important to be honest about these things. There is nothing crummy about any of the components or drive system–still it is basic and not high end. The clincher is it has a rear hub and a rear rack mount battery. 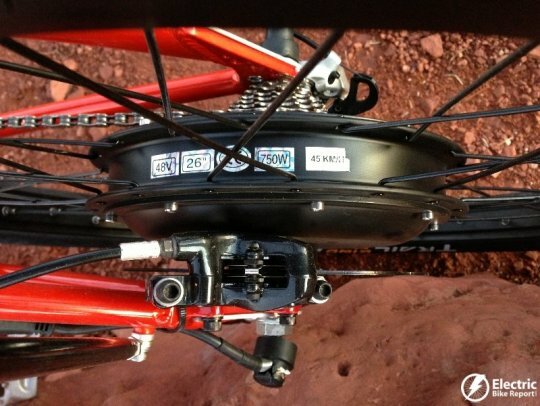 This makes any ebike off balance to the rear. For the uninitiated this means the bike is prone to do wheelies, hard to stand up on uneven ground, the front wheel is light & etc. 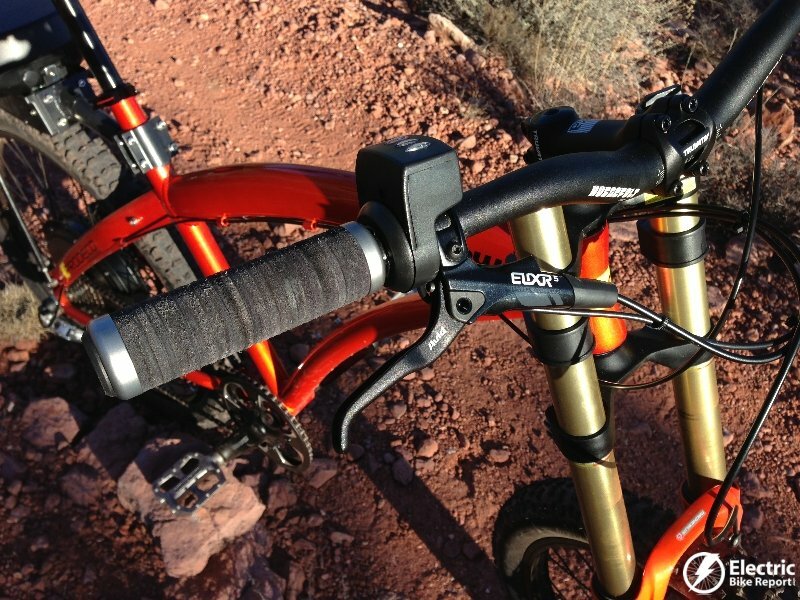 The companies that have mid drive and a froward and low battery mount go to substantial expense to engineer and produce such designs because those bikes usually handle better and are actually safer–these are high-end. A well designed rear hub motor bike can be high end IF the battery is placed forward of the bottom bracket such as in the triangle. This brings the weight forward to evenly balance the bike. 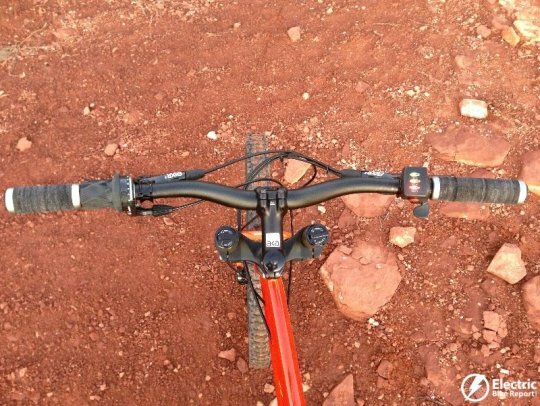 An off road bike like the SS is even more sensitive to the off balance of all the heavy weight in the rear–high in the rear at that. 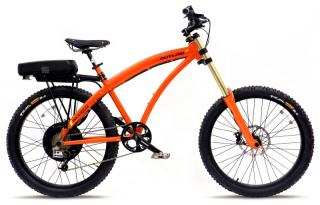 The battery would have to be placed in the triangle even if that added $200 to the price of the bike (shouldn’t even be that much) then the SS could perhaps be considered high-end–but it still would not be able to compete with true high end ebikes like Optibike, Stealth, Specialized & etc–High end would probably cost over $5000. 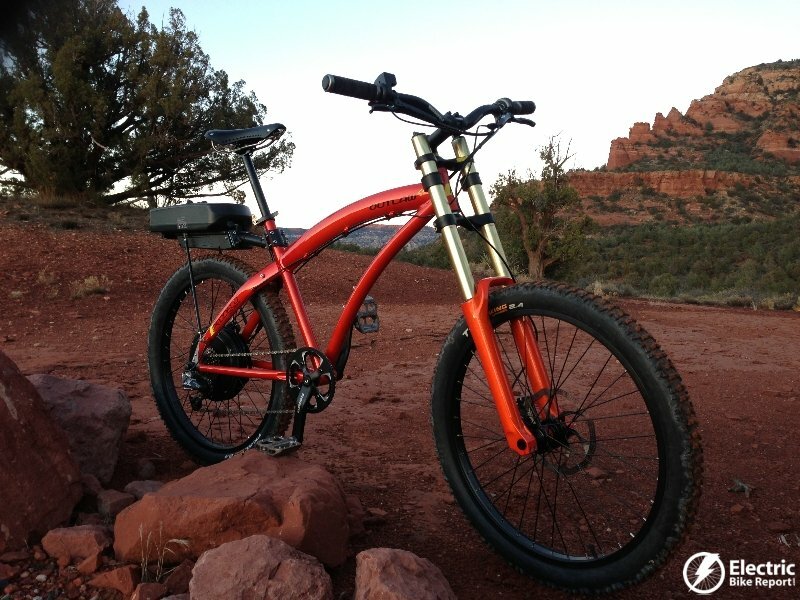 Again the Prodego Outlaw SS is a solid bike and is admirable quality for $2500.